Context: In cases of bimaxillary protrusion or severe crowding, extraction of 4 premolars and orthodontic treatment with retraction of the anterior teeth is a widely used approach. However, there is controversy over whether the changes that occur in the anterior alveolar bone always follow the direction and quantity of tooth movement. Aims: To evaluate and compare the changes in alveolar bone thickness, type of tooth movement and rate of retraction, before and after retraction of anterior teeth using micro-implants. Methods and Material: The subjects consisted of 15 ongoing orthodontic patients whose upper incisors were bound for retraction. 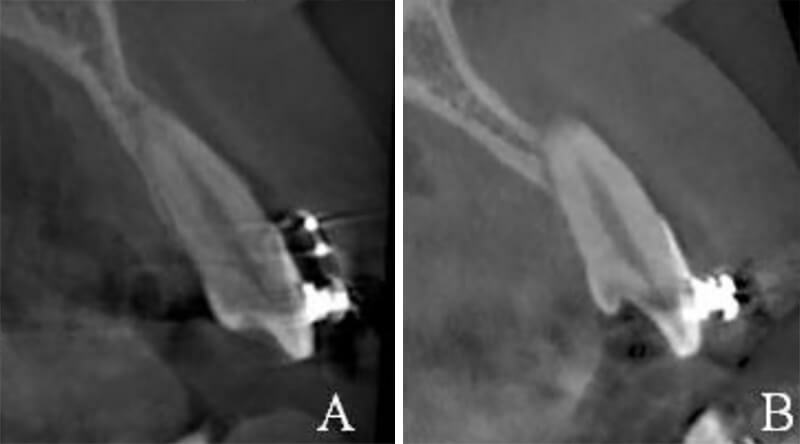 Changes in alveolar bone thickness in the retracted area were assessed using pre-retraction (T0) and post-retraction (T1) computed tomography images and lateral cephalograms. Labial bone thickness (LBT), palatal bone thickness (PBT), and total bone thickness (TBT) were assessed at the crestal (S1), mid-root (S2), and apical (S3) levels of the retracted incisors. Statistical analysis used: Paired t-tests were used to compare the difference of bone thickness between T0 and T1. 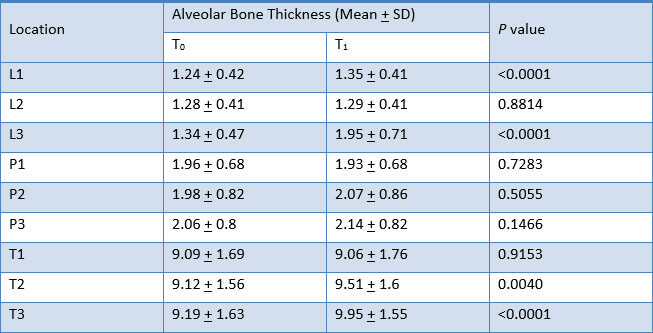 To determine the relation between the changes of alveolar bone thickness, and rate of tooth movement, changes of inclination, initial alveolar bone thickness, the Spearman rank correlation analysis was performed. Results: As the maxillary anterior teeth were retracted, the LBT at crestal and apical level and TBT at mid-root and apical level were statistically significantly increased (p < 0.05). The changes in alveolar bone thickness were significantly associated with rate of tooth movement and initial alveolar bone thickness. However, changes of inclination showed no significant association with changes in thickness of alveolar bone (p > 0.05). Conclusion: When tooth movement is limited, forcing the tooth against the cortical bone may cause adverse sequelae. Rate of tooth movement and initial alveolar bone thickness are the significant factors that may influence alveolar bone thickness during upper incisor retraction. These factors must be carefully monitored to avoid the undesirable thickening of alveolar bone. Postal address: Department of Orthodontics and Dentofacial Orthopedics, K.M. Shah Dental College and Hospital, Vadodara, Gujarat, India. We know that bone resorption occurs on the pressure area and bone apposition occurs on the tension area. Similarly in orthodontics, during the process of tooth movement such a phenomenon occurs. But there is a controversy that whether all the alterations that occurs during tooth movement in anterior alveolar bone always pursues the path as well as degree of tooth movement.1 In orthodontics, it is said that ‘‘bone traces tooth movement’’. According to it, whenever tooth movement takes place, the bone surrounding the alveolar socket remodels to the equal amount.2 But on the other hand, sometimes it may not occur with this rule, and a critical bone reaction may occur after incisor retraction. The labial cortical plate leads to increased bone which is larger than the displacement of tooth, leading to discernible bone exostosis, protuberance of labial bone, and an uneven crest of bone.3,4 Protuberance of labial bone typically leads to esthetic dilemmas, and usually alveloplasty is advised to abolish surplus alveolar bone. Presently, the mechanisms leading to diverse alveolar bone reactions are indistinct; there is curiosity in finding out the factors associated with alterations in alveolar bone thickness throughout incisor retraction. In terms of alveolar bone remodeling, there are two perceptions in orthodontic tooth movement. If the bony remodeling is occurring in coordination of resorption and deposition, then the bone remodeling and tooth movement will occur at a 1:1 ratio, and the tooth will stay in the alveolar covering. This type of movement of a tooth is termed as ‘‘with-the-bone.’’5 On the other hand, if there is no equilibrium between resorption and deposition of the alveolar bone throughout the tooth movement, then the tooth will tend to come out of the alveolar covering. This type of movement of a tooth is termed as ‘‘through-the-bone.’’6 Thus, a careful assessment of alveolar bone and roots of the anterior teeth should be done after en masse retraction to determine the therapeutic limitation of orthodontic tooth movement based on the ‘‘with-the-bone’’ and ‘‘through-the bone’’ concepts. The patients having bimaxillary protrusion may not be well thought-out to have a soft tissue profile which is pleasing esthetically. The anterior teeth of such patients have dentoalveolar flaring, with secondary protrusion of the lips and convex facial profile.7 In such patients, the management is extraction of four first premolars in order to decrease the convexity of face and permit retraction of the anterior teeth to a more pleasing and possibly a more stable position.7 The retraction of anterior teeth is done with maximum anchorage. Maximum anchorage preservation of posterior teeth permits greater retraction of the anterior teeth.7 To overcome the objectives of treatment, anterior teeth are extremely retracted but the alveolar bone remodeling with such a type of tooth movement varies with each patient. When the area for retraction is very less, then constant application of force to the tooth may leads to incisor roots to touch the cortical plate. This may lead to cortical plate resorption and root exposure. In the study done by Adel AlHadlaq10, he evaluated the thickness of alveolar bone in the anterior region. There are few studies11-13 which evaluated only the thickness of alveolar bone before and after retraction of anterior teeth. In the above studies they have used friction and frictionless mechanics which may cause variable amount of forces. In the study done by Simten Sarikaya et al.2, the loop mechanics (Poul Gjessing spring) has been used for retraction which may cause variable amount of forces in different direction. The amount of force used for retraction will be more than required. In other study done by Nuengrutai Yodthong et al.12, they have not used uniform mechanics for retraction of incisors which again may have an effect on tooth movement and alveolar bone. Therefore, the study was taken up to evaluate and compare the changes in thickness of alveolar bone, type of tooth movement and rate of retraction, before and after retraction of anterior teeth using micro-implants. The study design is a cross-sectional study. The sample size included in our study was 15. The inclusion criteria of the study were participants with well aligned maxillary teeth with extracted maxillary first premolars and ready for retraction and age ranging from 17 to 25 yrs. The exclusion criteria of the study were retreatment or relapse cases, mild to moderate crowding with less than 6 mm extraction space for retraction, congenitally missing teeth, extraction of teeth except first premolars and third molars due to any other reason, severe skeletal asymmetry. The study was approved by the institutional ethics committee. The participants were selected based on the inclusion and exclusion criteria designed for the study. The participants were having maxillary anterior teeth levelled and well aligned with two premolars extracted for orthodontic purpose. These participants were registered for the study after obtaining the written informed consent form. The participants were provided with a participant information sheet. They were subjected to CT scan and lateral cephalogram. The records were collected and analyzed. In order to evaluate the changes of alveolar bone and potential influencing factors after upper incisor retraction, CT scan and lateral cephalograms were taken at the beginning of retraction and at the completion of retraction. Parameters measured in this study included the rate of tooth movement, changes of inclination, and type of tooth movement, which were measured using lateral cephalograms, while the alveolar bone thickness was measured by the computed tomography. The changes of inclination of anterior teeth were evaluated from lateral cephalometric radiographs. The pre-treatment and post-treatment lateral cephalograms were traced and type of tooth movement was evaluated. The angle between the axis of the maxillary central incisors and the palatal plane (UI-PP) was measured (Fig. 2). The thickness of the buccal and palatal alveolar bone of anterior teeth was determined at the position neighbouring to the broadest point of the bucco-palatal root, in 3 slices divided by 3 mm at crestal (S1), midroot (S2), and apical (S3) levels respectively (Fig.3). These levels are specified along the long axis of the tooth and are situated every 3 mm above the cementoenamel junction (CEJ) level. Buccal, palatal, and total alveolar bone thickness were assessed at the crestal level (S1; L1, P1, and T1), midroot level (S2; L2, P2, and T2) and apical level (S3; L3, P3, and T3) at pre-retraction and post-retraction. The alveolar bone thickness of each side and level of the six teeth was then averaged to represent mean thickness of the particular side and level. Bony defects like fenestration and dehiscence were recorded. The total time taken for retraction was recorded and rate of tooth movement was calculated. The post-retraction CT scan and lateral cephalogram were taken for analysis. The alveolar bone thickness was evaluated at S1, S2 and S3 levels in CT scan obtained after retraction. The defects in the alveolar bone were also recorded. The thickness of alveolar bone, type of tooth movement and bony defects were compared. A paired t test was utilized to assess the alveolar bone changes that arise as a result of retraction of incisors with a significance level of 0.05. Spearman rank correlation analysis was used to recognize any associations between the factors and the changes of alveolar bone. 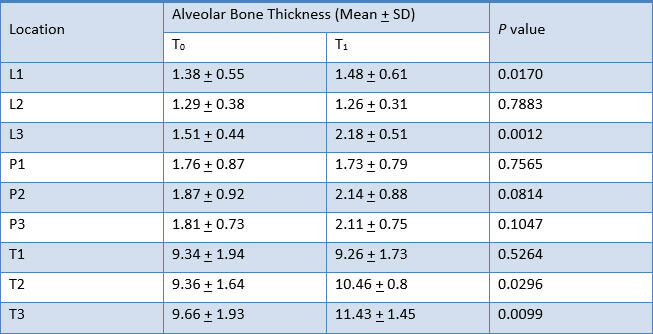 The reproducibility of bone thickness and bone level measurements was assessed by calculating method error from the difference between two measurements taken at least one week apart. The measurement error was calculated from the formula of Dahlberg14. The reliability of the data was evaluated by calculating the intraclass correlation coefficient (ICC)15. Based on the clinical importance of measurement errors, the significance might be high (ICC ≥0.95), acceptable (0.80 >ICC <0.95), or low (ICC ≤ 0.80). 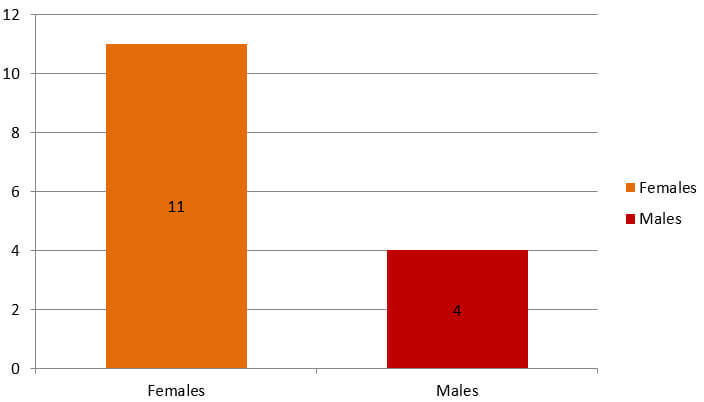 Eleven female and four male patients (mean age, 21 ± 2.56 years; range, 17–25 years) were included in the study (Graph 1). All the fifteen patients were retracted with sliding mechanics. Stainless-steel wire of 0.017×0.025 inch was used for retraction in patients. In this study, all measurements were repeated 1 week apart and calculated to determine the intra observer reliability. 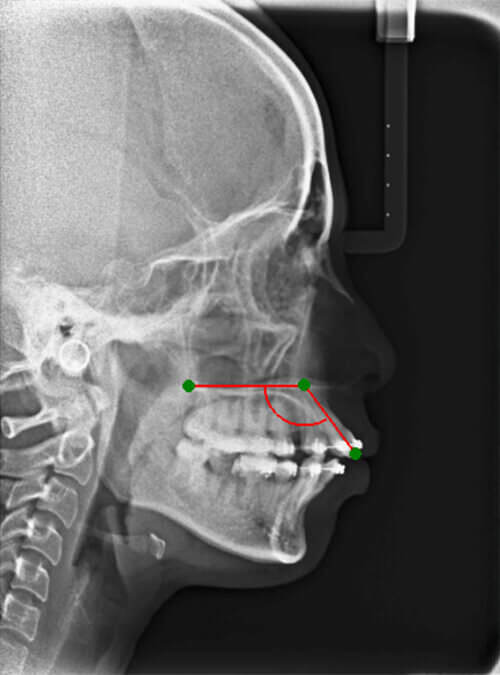 Dahlberg’s error was 0.26 mm, ranging from 0.00 to 0.35 mm for the alveolar bone thickness measurement from computed tomography and 0.6°, ranging from 0° to 1.0° for the angular measurement from lateral cephalometric radiographs. Paired t-test showed no significant difference between two series of measurements. Intraclass correlation coefficients were performed to assess the reliability of the measurements. The reliability of measurements was found to be within 0.90-0.93, and the method was found an acceptable level. The difference in mean inclination of incisor pre-retraction and post-retraction is shown in Table 1, Graph 2. 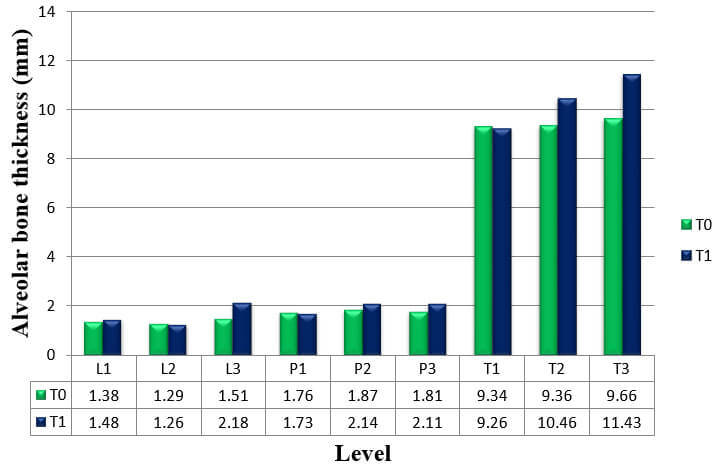 The means, standard deviation, and ranges of extraction space, retraction time, and rate of tooth movement are shown in Table 2. CT scan was performed before and after upper incisor retraction. 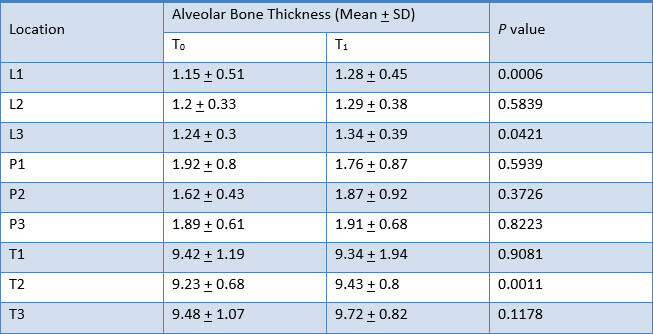 Shapiro-Wilk test was used to test the normality, and found that mean alveolar bone thickness was normally distributed. 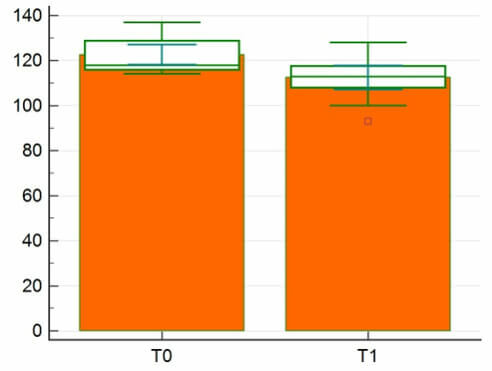 Paired t-tests were used to compare the difference in mean alveolar bone thickness pre-retraction (T0) and post-retraction (T1). 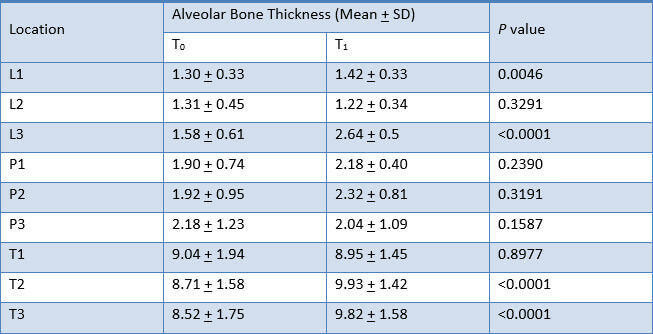 The result for mean change in thickness of alveolar bone of the six anterior teeth, as measured from CT scans at T0 to T1, is shown in Table 3, Graph 3. 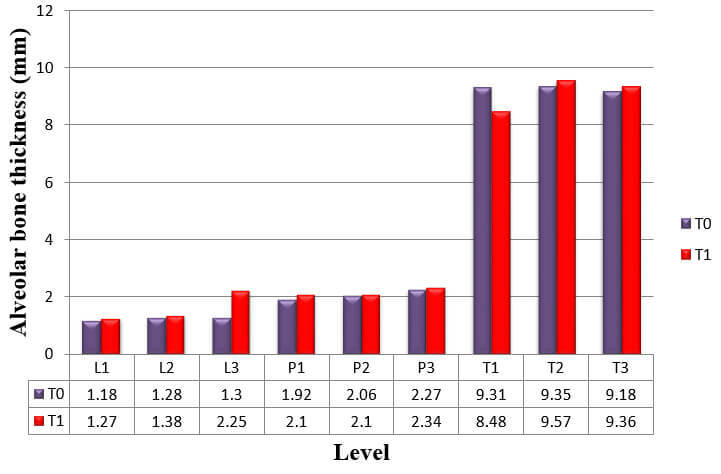 Alveolar bone thickness significantly increased at L1, L3, T2 and T3. These findings were consistent to the results from the analysis of the difference in alveolar bone thickness in maxillary right canine, maxillary right lateral incisor, maxillary right central incisor, maxillary left central incisor, maxillary left lateral incisor, and maxillary left canine respectively (Table 4, 5, 6, 7, 8 and 9). 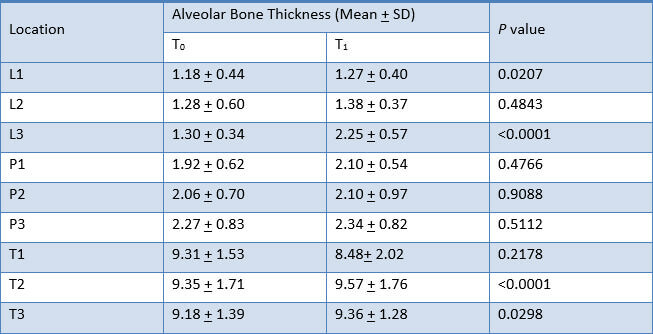 For alveolar bone thickness changes at L1 showed a strong correlation with rate of tooth movement (r = 0.588; p = 0.0210). Alveolar bone thickness changes showed a negative correlation with changes in incisor inclination. 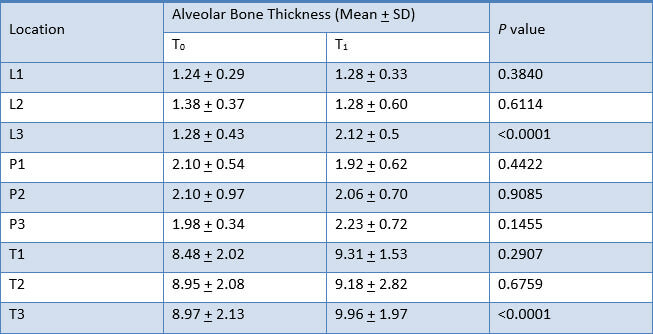 Initial alveolar bone thickness showed a highly significant correlation with alveolar bone thickness changes at L1, L3, T2 and T3 levels (p <0.0001). In order to assess dentoalveolar morphology in both sagittal and vertical dimensions, orthodontists often use cephalometric tracings. However, this fails to assess bone thickness. Conventional 2D lateral cephalograms have numerous drawbacks in terms of investigating the changes in the alveolar bone and roots, particularly in the anterior region, as a consequence of the midsagittal projection. CT scanning is the three dimensional imaging technique giving quantitative assessments of the labial and lingual cortical bone plates and labio-lingual width of alveolar bone with elevated accuracy and precision.9 Therefore, this study was designed to use CT scan measurements to more precisely assess changes in thickness of alveolar bone. The purpose of this study was to evaluate and compare the changes in thickness of alveolar bone, type of tooth movement and rate of retraction, before and after retraction of anterior teeth using micro-implants. The present study demonstrated that alveolar bone thickness at L1, L3, T2 and T3 levels significantly increased when the en-masse retraction of upper anterior teeth was carried out (Fig.4). The results of this study disputes with the results of De Angelis1, who presented the bending capacity of alveolar bone. The deformed alveolus changes the electric atmosphere, a phenomenon that is accredited to the piezoelectricity of bone. As a result, the theory is that highly synchronized coordinated changes are triggered with coordinated apposition and resorption, the alveolar bone retains its structural characteristics and size as it moves. The results demonstrated significant increase in the labial bone thickness at crestal level which was similar to the study of Bimstein et al.16, which reported that an increase in the amount of buccal alveolar bone may take place as a result of orthodontic treatment that involves lingual positioning of procumbent mandibular permanent central incisors. Palatal bone thickness did not remain the same; rather, it decreased at the crestal level. But it was not statistically significant. This finding disagreed with the results of Sarikaya et al.2, Ten Hoeve and Mulie.17, Wehrbein et al.18, Vardimon et al.19 and Wainwright20. The hypothesis of this study was that when controlled forces are used with proper biomechanics it might be possible to achieve better tooth movement with least possible damage to the alveolar bone. Spearman rank correlation analysis was used to recognize any associations between factors and the mean changes of alveolar bone of six anterior teeth. The result demonstrated significant correlations between rate of tooth movement, initial alveolar bone thickness and changes in thickness of alveolar bone after upper anterior retraction. Furthermore, no significant correlation was found between changes of inclination and changes in thickness of alveolar bone. at crestal level; L1 (r = 0.588; p = 0.0210). The result indicated rate of tooth movement was related to alveolar bone thickness changes at L1. The result is similar to reports of Mimura3 who reported that the maxillary alveolar process failed to remodel as the upper anterior teeth were intruded and retracted, leaving behind a prominent labial ridge of bone. In our study, it was demonstrated that the faster rate of incisor retraction, the more bone thickness at labial crestal level increased. Bone remodeling process may not be able to catch up with too rapid tooth movement. The result showed total alveolar bone thickness was decreased at the crestal level but it was not statistically significant. It can be interpreted that the rate of resorption on the labial aspect is relatively slower than the rate of apposition on the lingual aspect (secondary bone remodeling) followed by bone prominent (Fig.5). A longitudinal follow up study would be beneficial to explain the long term response of the alveolar bone to various tooth movement rates. Changes of inclination showed no significant correlations with changes of alveolar bone thickness. This finding disagreed with the result of Abdwani et al.21 and Nimri et al.22, who reported that the effects of incisal inclination changes, due to orthodontic treatment will result in a change in the position of point A. 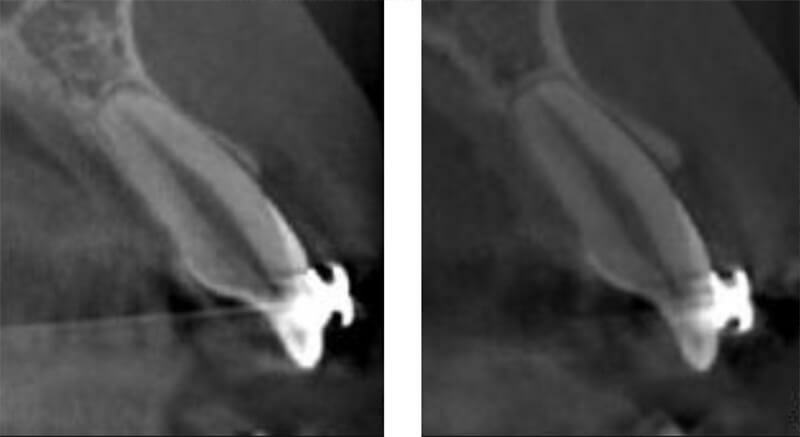 One patient exhibited root perforation, labial bone fenestration and dehiscence at apical level following anterior retraction (Fig.6). However, on the basis of laminagraphic evidence by Ten Hoeve and Mulie17, suggested that the cortex would be re-established within 6 months, no matter how extensive the tooth movement was. Although the mean values in our study did not indicate the presence of fenestration or dehiscence, individual findings are also important when focusing on iatrogenic sequelae. The anatomical limits set by the cortical plates of the alveolus may be regarded as orthodontic walls.23 Since the cortical plates of the palate are represented only in 2 dimensions on lateral cephalograms, the examiner cannot rule out iatrogenic sequelae during or after tooth movement based on these films. Therefore, unlimited tooth movement is not possible during retraction of the incisors. 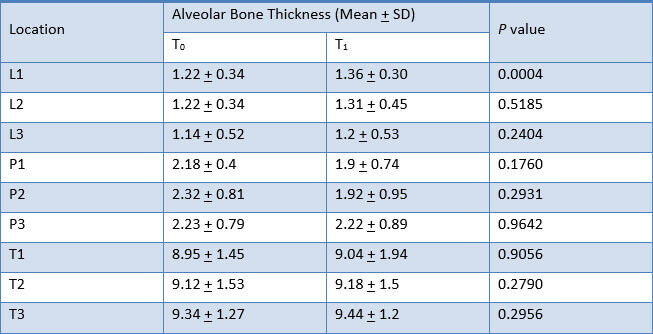 Furthermore, significant correlation was found between initial alveolar bone thickness and changes of alveolar bone thickness. The results agreed with Rungcharassaeng et al.24, who studied the factors that might affect buccal bone changes of maxillary posterior teeth after rapid maxillary expansion. The results suggested factors that showed significant correlation to buccal bone changes and dental tipping on first premolars and molars were age, appliance expansion, initial buccal bone thickness, and differential expansion. But the result of this study disagrees with the results of Yodthong et al.12, who reported that there is no correlation between initial alveolar bone thickness and changes of alveolar bone thickness. Fig.4: Changes in alveolar bone thickness on labial aspect of the anterior teeth during anterior retraction. Fig.5: Illustration of secondary bone remodeling process may not be able to catch up with too rapid tooth movement. As the upper incisors are retracted, labial bone thickness at crestal (L1) and apical (L3) level and total alveolar bone thickness at mid-root (T2) and apical (T3) level significantly increases. Rate of tooth movement and initial alveolar bone thickness were related to alveolar bone thickness changes after upper incisor retraction. No significant correlation was found between changes of inclination and changes in thickness of alveolar bone after upper incisor retraction. De Angelis V. Observations on the response of alveolar bone to orthodontic force. Am J Orthod. 1970;58:284–294. Sarikaya S, Haydar B, Ciger S, Ariyurek M. Changes in alveolar bone thickness due to retraction of anterior teeth. Am J Orthod Dentofacial Orthop. 2002;122:15–26. 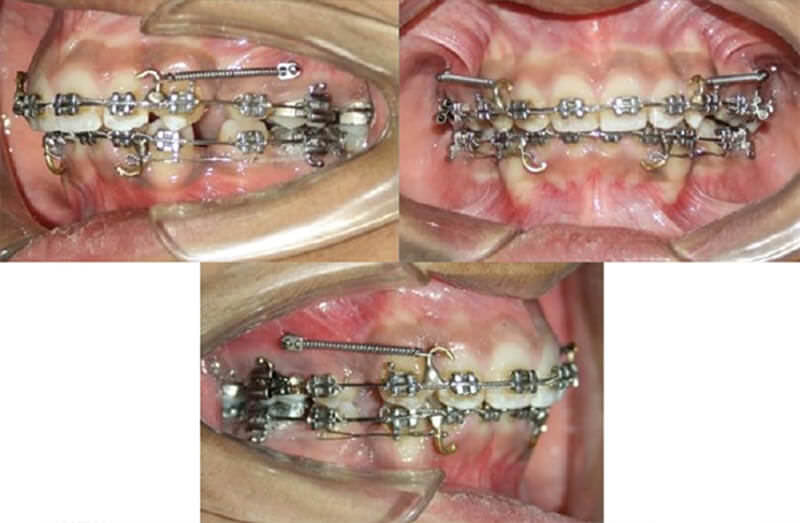 Mimura H. Treatment of severe bimaxillary protrusion with miniscrew anchorage: treatment and complication. Aust Ortho J. 2008;24:156–163. Lin J, Yeh C, Liou E, Bowman S. Treatment of skeletal-origin gummy smile with miniscrew anchorage. J Clin Orthod. 2008;5:285–296. Melsen B. Biological reaction of alveolar bone to orthodontic tooth movement. Angle Orthod. 1999;69:151–158. Verna C, Zaffe D, Siciliani G. Histomorphometric study of bone reactions during orthodontic tooth movement in rats. Bone. 1999;24:371–379. Farrow AL, Zarinna K, Azizi K. Bimaxillary protrusion in black Americans-an esthetic evaluation and treatment considerations. Am J Orthod Dentofacial Orthop 1993;104:240-50. 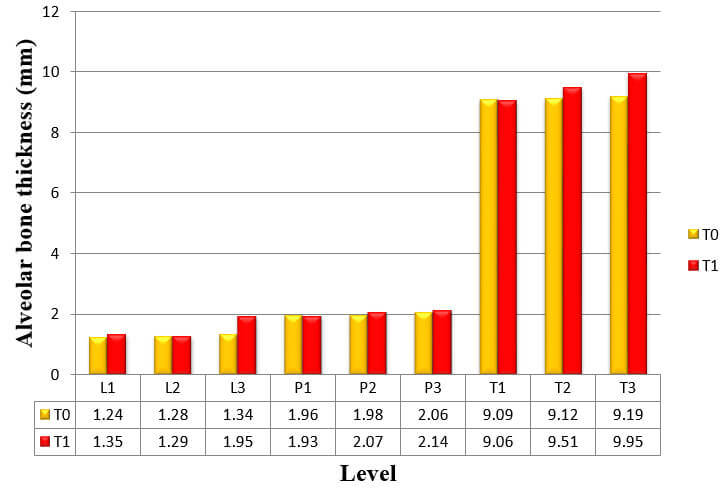 Fuhrmann R. Three-dimensional evaluation of periodontal remodeling during orthodontic treatment. Semin Orthod. 2002;8(1):23-8. Fuhrmann R. Three‑dimensional interpretation of labiolingual bone width of the lower incisors. Part II. J Orofac Orthop 1996;57:168‑85. AlHadlaq A. Anterior alveolar dimensions among different classifications of sagittal jaw relationship in Saudi subjects. The Saudi Dental Journal. 2010;22;69–75. Nayak Krishna US, Shetty A, Girija MP, Nayak R. Changes in alveolar bone thickness due to retraction of anterior teeth during orthodontic treatment: A cephalometric and computed tomography comparative study. Indian J Dent Res 2013;24:736-41. Yodthong N, Charoemratrote C, Leethanakul C. Factors related to alveolar bone thickness during upper incisor retraction. Angle Orthod. 2013;83:394–401. Upadhyay M, Yadav S, Patil S. Mini-implant anchorage for en-masse retraction of maxillary anterior teeth: A clinical cephalometric study. Am J Orthod Dentofacial Orthop 2008;134:803-10. Dahlberg G. Statistical Methods for Medical and Biological Students. London, UK: Allen and Unwin; 1940:122–132. Donner A, Zou G. Testing the equality of dependent intraclass correlation coefficients. Statistician. 2002;51:367–379. Bimstein E, Crevoisier RA, King DL. Changes in the morphology of the buccal alveolar bone of protruded permanent mandibular incisors secondary to orthodontic alignment. Am J Orthod Dentofacial Orthop 1990; 97: 427-430. Ten Hoeve A, Mulie RM. The effect of antero-postero incisor repositioning on the palatal cortex as studied with laminagraphy. J Clin Orthod 1976;10:804-822. Wehrbein H, Fuhrmann RA, Diedrich PR. Periodontal conditions after facial root tipping and palatal root torque of incisors. Am J Orthod Dentofacial Orthop 1994;106:455-462. Vardimon AD, Basset B. Cortical bone remodeling/tooth movement ratio during maxillary incisor retraction with tip versus torque movements. Am J Orthod Dentofacial Orthop 1998; 114: 520-529. Wainwright WM. Faciolingual tooth movement: its influence on the root and cortical plate. Am J Orthod 1973; 64: 278-302. Abdwani R, Moles D, Harold Noar J. Change of inclination effects on points A and B. Angle Orthod 2009; 79: 462-467. 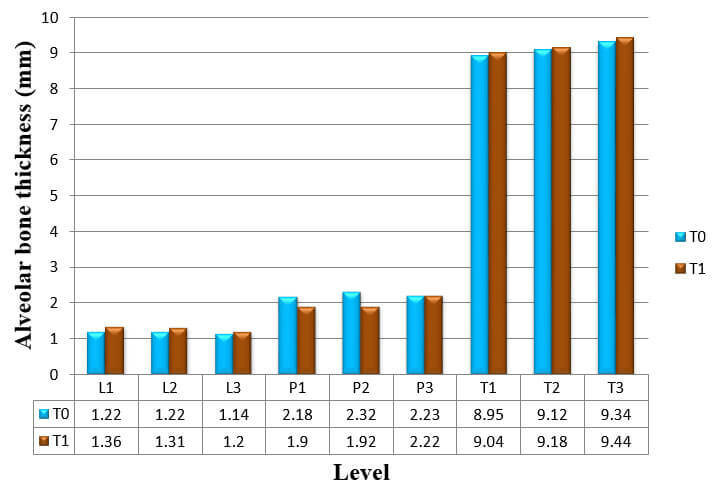 Nimri K, Hazza A, Omari R. Maxillary incisor proclination effect on the position of point A in class II division 2 malocclusion. Angle orthod 2009; 79: 880-884. Handelman C. The anterior alveolus: its important in limiting orthodontic treatment and its influence on the occurrence of iatrogenic sequelae. Angle Orthod 1996; 66: 95-110. Rungcharassaeng K. Caruso M, Kan J, Taylor G. et al. Factors affecting buccal bone changes of maxillary posterior teeth after rapid maxillary expansion. Am J Orthod Dentofacial Orthop 2007; 132: 428.e1-428.e8.